I love cookies. I mean, I really love cookies. Whether it's a basic shortbread cookie or an oatmeal raisin, they all hold a special place in my stomach. I never knew, however, how much I could love a flourless chocolate cookie until now. Admittedly, I had my doubts about flourless cookies. But being wrong never tasted so right! 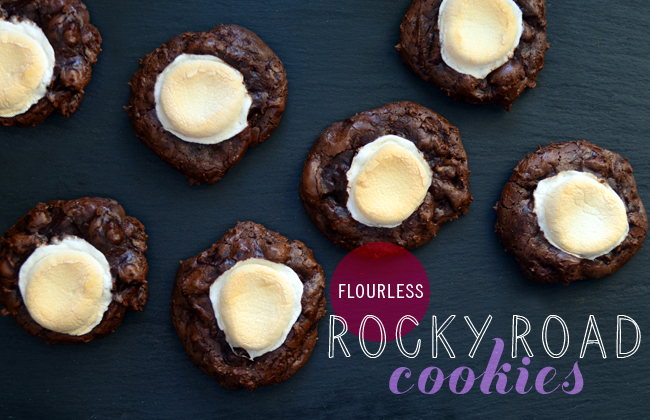 These rocky road cookies are rich, gooey and decadent like a chocolate fudge brownie, while only requiring a fraction of the baking time! 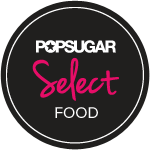 And, if gluten-free is your thing, you're in luck. This recipe is one of the easiest I've ever created and they don't lack an ounce of flavor with the help of our friends, chocolate chips, walnuts and marshmallow. Plot and construct your own rocky road by swapping out the walnuts for your favorite nut, or use mini marshmallows! I personally love the "fried egg" look with the bigger marshmallows. 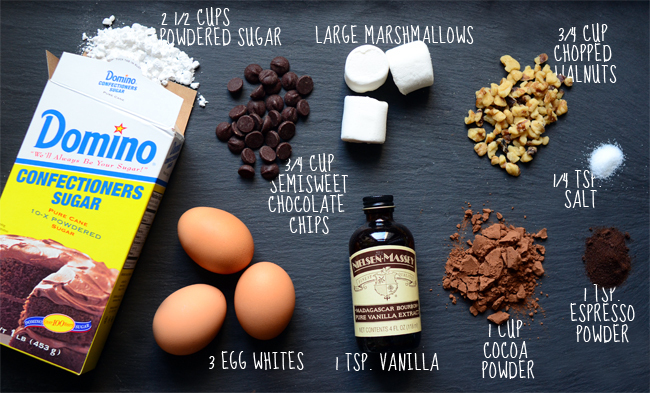 If it were up to my husband, graham crackers would have been included and some smoking techniques to make these full-fledged "s'mores" cookies. But you have to draw the line somewhere, right? Make sure you use a good quality cocoa powder and don't forget the espresso powder. Remember, chocolate baked goods always taste better with a hint of espresso! 1. Preheat the oven to 350°F. Line two baking sheets with liners or parchment paper. In a large bowl, whisk or sift together the confectioners' sugar, cocoa, salt, and espresso powder. 2. Mix in the egg whites and vanilla until smooth and no lumps remain. 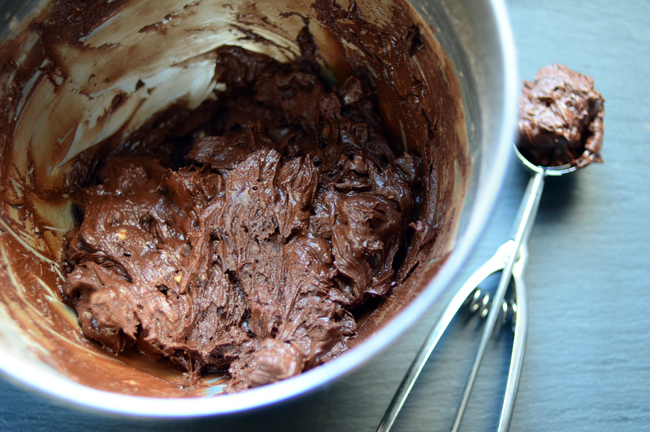 Add the chocolate chips and walnuts, stirring until fully incorporated and dough is gooey. 3. Use a cookie scoop to drop round balls of dough on the baking sheets. Leave about 2 inches between cookies. 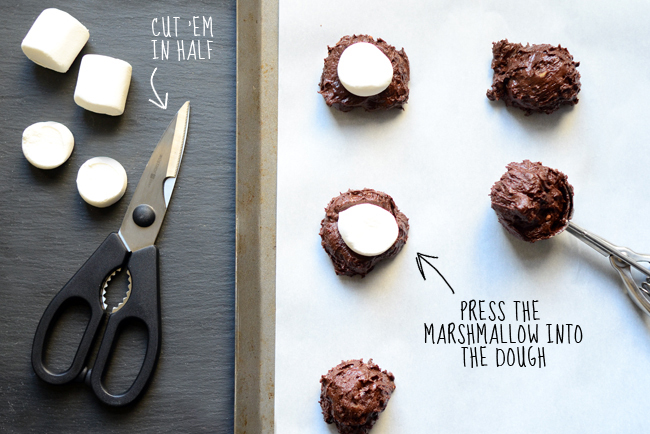 Press a marshmallow half firmly into the top of each dough ball. 4. 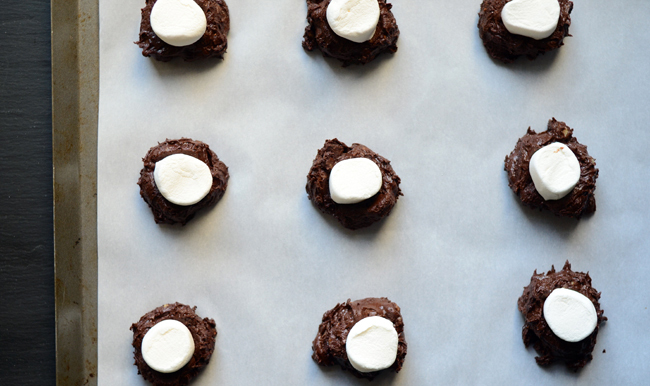 Bake the cookies for 10 to 12 minutes, or until the marshmallows are nice and toasty on top. The cookies will look shiny and cracked. Cool slightly before eating. 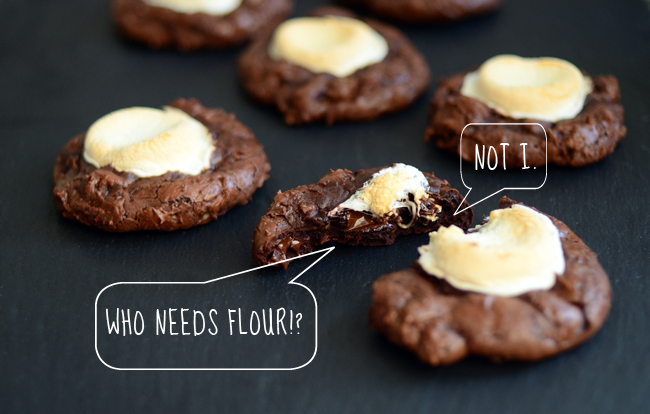 These look so yummy and I'm totally intrigued by the idea of a flourless chocolate cookie! I would love to try one of these!